I found three new reds to consider, after all a girl can never have too many. 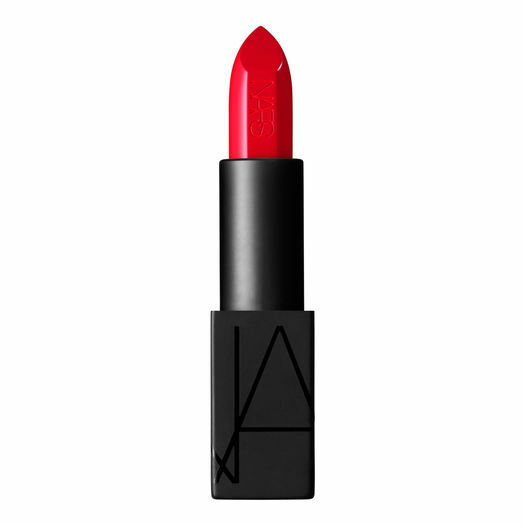 The New Audacious collection by Nars has a hue for everyone, there are nudes, reds and every color you can imagine. I found these three and once I’m at my Neighborhood Nars on Fillmore Street I’ll even consider the nudes. Hi! I bought Carmen over the weekend. It’s a darker pink-red, at least I think it is. I bought it at the Nars on Fillmore Street, you can do a charge send? ask for Dalia, she’s great and can describe all of the shades to you. Just make sure to try on all of the reds, first try the colors on the backs of your hands and try on all of the ones you like on your lips. Have fun and let me know which one you couldn’t live without. I also got Rita and Charlotte. I LOVE Charlotte – i like wearing it with Nars Nihiwatu lip liner. I am not loving Rita as much as i thought I would but am keeping it because Rita Hayworth was my grandmother’s favorite actress and there has to be a way I can make Rita work! I’m going to end up buying that makeup bag with the dragon girl and ysl nail polish, it’s only $25 more….. I know, but I’m in lobe with the Butter London Red Red, love the matte texture…. I had quite the red lipstick weekend. I picked up Kat Von D’s Underage Red (it is gorgeous) along with two Sephora red lip pencils, Scarlet and The Red. And I got Chanel Pirate lip gloss (because I already have the lipstick, which is a beautiful red by the way) and their Rouge Profond Pencil. It’s my new favorite! Do you have any other mattes you can recommend? I just tried Chanel’s La Flamboyante but it is limited edition for holiday but i really like it (the counter had to have it shipped from another location). Also Kat Von D Underage Red and NYX Cosmetics Perfect Red and Bloody Mary. Other good Chanel ones are Passion and Pirate – they are matte but not drying and feel nice on the lips. Ruby Woo from MAC is still my favorite. Love that one. Thank you! I’ll keep them in mind….